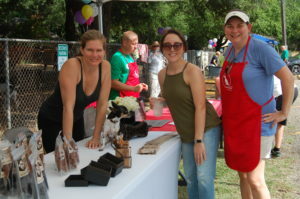 Dallas canines kicked off summer with a Dog Park Festival at Central Community Dog Park Saturday morning. Dogs and their owners from around the community came out to enjoy food, drinks and music while the canine family member joined a game of Frisbee or whatever it is dogs do when it’s their party. Vendors like Mi Beada were selling yard art and jewelry (much of it pet inspired) and Jaksnaks was selling homemade, organic treats and eats. Wheels and Phoebe JoAnn chose Yam Bam Cookies made of organic sweet potatoes, flax and pork for their take-home treat. Mary Chris Gibbons of Mi Beada will create a personal piece of jewelry with your dog’s picture. For more information about Jaki’s treats visit jaksnaks.com or call the church at 214-526-7291 to leave a message for Mary Chris. During the party, dogs could also spiff-up for their summer trip to the beach with a nail trim or take a bath at the dog wash. If a new puppy needed to learn some manners before heading off on vacation, a trainer was on hand to give the new pet owner some tips. Hot dogs, bagels and ice-cold water were available as well as a Starbucks Puppuccino for Fido. If you missed the party, visit Central’s dog park anytime. It is a community park, open to the public, seven days a week from sunrise to sunset. Although it may feel like it, the “dog days of summer” are not even here yet according to Sirius, the dog star, but you can stay cool under the mature live oaks that shade the park. There is plenty of seating for conversation with other “dog people” or a quiet place to read. A new “library” and a magazine stand holding current issues of “Family Dog” has been added for your reading enjoyment while visiting the park. Visit anytime! Or bring your dog to church. Church in the Dog Park is a casual worship service celebrated at 9 a.m. on the first and third Sundays of the month. Sing-a-longs, a short sermon, coffee and donuts start your week off right.